This month, I have continued with experimenting and trying out different techniques. Late on, I finally made a start on making my first proper Art-Brooch designs from polymer clay. The problem I am finding is that I get side-tracked, spending more time making things with the off-cuts, as I do not want to see them go to waste. I must stop doing this, just save them to use another time, and concentrate on completing the design I set out to make. The other day, I ordered a very small rubber stamp for imprinting my initials, when I finish the backs of my brooches. It just has CF with ‘original’ underneath the initials, all contained in square border with rounded corners. I was limited by the font and proportions of the stamps available for a simple ‘design on-line’ but it will do for the moment, to try the idea. I have been trying to decide for a while whether to sign the brooch backs with my signature or whether to have a stamp made with my insignia. Before going to great cost and designing artwork for an insignia, I thought I would try this out and at least it will enable me to actually complete the few brooch designs I have started so far. This weekend I have been concentrating on perfecting the Skinner blend technique. I have also made two brooches using this technique. The first one is made from a Skinner blend of custom mixed red and purple. I cut the individual pieces from the raw clay that had been rolled out on the #4 setting on my Polyclay Roller (pasta machine). Once they had been baked and cooled, I laid them over the original paper design I had drawn and found I needed to trim some of the pieces, so they fitted together precisely. I then pressed the individual pieces into a sheet of rolled black polymer clay, leaving a small gap between them, trimmed around the outer edges and re-baked it. The brooch still needs finishing but I like the ‘mosaic-style’ effect, without the mess of grouting between the pieces. 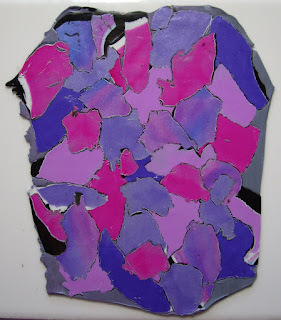 I also learnt from my first attempt at this style that the ‘mosaic’ pieces do not have to be very thick, as they really just press onto the surface of the underlying clay, rather than sink into it. The polymer clay trimmed really easily with a scalpel and scissors at this #4 thickness, which gave me an idea that I tried by making a second brooch. My second brooch, using the same design, is made from a Skinner blend of custom mixed purple and turquoise. This time I baked the complete sheet I had made of this Skinner blend. When it was cool, I cut out the individual pieces for the design, from selected areas of the sheet. It was much easier to cut precise shapes doing it this way (as when cutting the clay raw, the slightest amount of unintentional pressure can distort the shape slightly, when working on such a small scale). As before, I pressed the individual pieces into a sheet of rolled black polymer clay, leaving a small gap between them, trimmed around the outer edges and re-baked it. 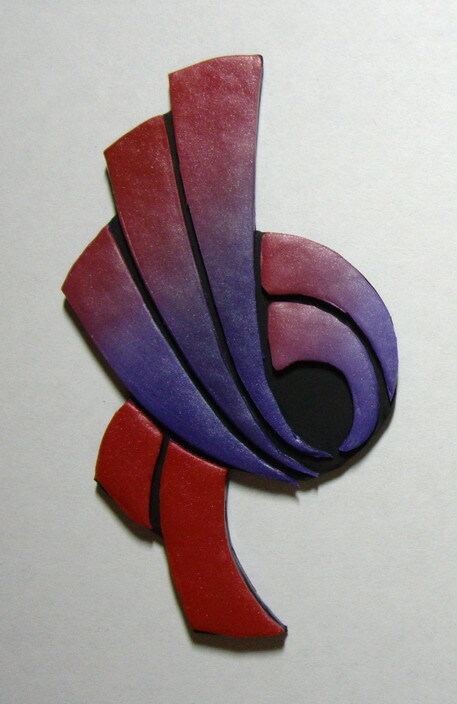 I feel I have achieved a better flow of colours in the design on this second brooch. Having the sheet already baked, you can move a template around until you are happy with a selected area of colour, with out worrying about getting finger prints or marks on the surface. Certainly for making ‘mosaic-style’ brooches, this latter method would be better. I could pre-bake different coloured/patterned sheets to be cut up at a later date – as this would not be messy or need immediate baking, it is possibly something I could do at my desk, before I start work in the mornings. Also, as the clay is already baked, I do not have to worry about doing something with the left over pieces, they will just save for use at another time. It was just this need to do something with some left over unbaked clay, which lead to me creating this sheet. I thought I would try the ‘torn paper’ technique, except it was quite a while ago that I had read how to do it and halfway through, I realised that I had rolled the white layer out too thin, so you cannot really see it. I still like the effect though, in fact, I think I will use it as a new background for my blog title. It was good fun to do, so I will have to find and read the instructions and try it again sometime. Having just got Donna Kato’s book, ‘The Art of Polymer Clay Creative Surface Effects’, I thought I would try one of the techniques from it. I have had a couple of bottles of alcohol ink and some blending solution sat in my craft box for months (I originally bought them to use with Friendly Plastic), so I decided to try the alcohol ink on metal leaf technique, as I am very fond of rolling metal leaf into the surface of polymer clay. This is my first attempt. I worked the ink too much and lost the distinct blotches of different colours (I only have two colours of ink) but the principle worked. I did as it says in Donna’s book and covered it with the thinnest possible layer of translucent clay. When it had been baked, I was rather disappointed that the black polymer clay background, showing through the cracks in the metal leaf, looked brown (not noticable in this photo). Also, the translucent clay top layer had dulled the shine from the metal leaf. I will try putting a gloss glaze over it, when it has been incorporated into a brooch design, to see if this restores the original look. Maybe I baked it too long, or I should have covered the translucent clay layer with cornstarch (which I believe I read somewhere should stop it discolouring) or I should have plunged it into ice cold water after baking? I will have to do some more experimenting. Otherwise, rather than putting the translucent clay layer over the top to protect the metal leaf, I would rather use a glaze, so the vibrancy of the coloured metal leaf is not lost. 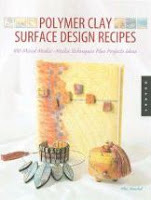 I am now busy reading this, the latest polymer clay book to add to my growing collection. Donna’s work is so immaculately finished, she is obviously a perfectionist (like me) and I greatly admire her skill. 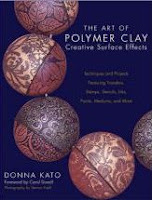 I am rather daunted by how long it will take me to try out every technique in Donna’s book, as well as Ellen’s. My exhibition idea will definitely have to be a long term project, but I will make many brooches along the way, and hopefully by the end of it I will have gained some very valuable ‘all round’ experience of the different techniques that can be used with polymer clay. Maybe then I will be proficient enough to teach workshops, which is something I would really like to do. Having now read Ellen Marshall’s book from cover to cover, I am fired up with enthusiasm. In fact, it has inspired an idea, for a future exhibition. 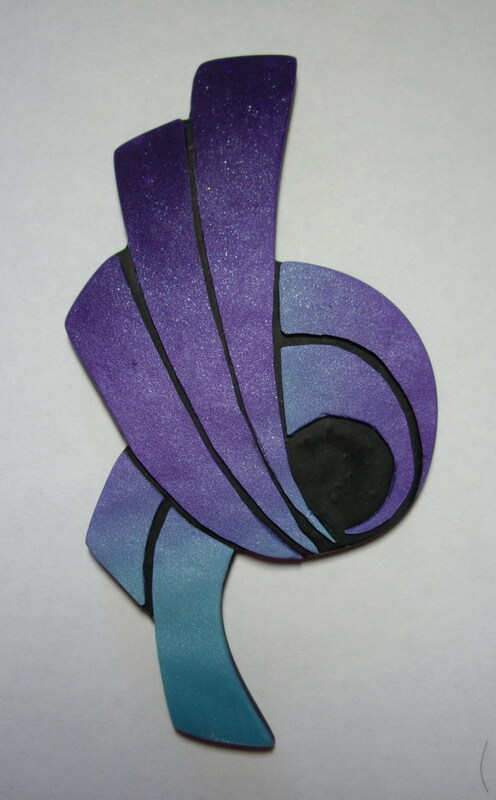 I will make several Art-Brooches, as I try out each technique, and keep the best one as an example of that technique. 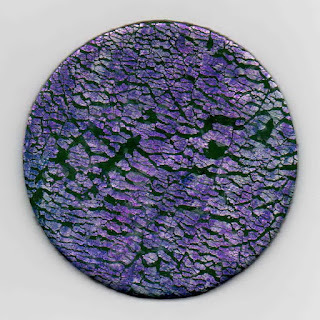 It may take me several years but I shall then be able to create an interesting and informative exhibition, titled something like: 101 Polymer Clay Brooches – different surface and decorative techniques. I believe this exhibition will be of interest to polymer clay artists/hobbyists, from a technical pint of view, showing physical examples of the many different techniques that can be used with this medium. I also think that brooch collectors and anyone interested in art, craft and design will find this exhibition of interest, as each brooch will be a unique ‘mini artwork’, as well as a piece of jewellery to wear. I maybe getting a bit carried away here, but if each brooch is mounted on a small canvas and has an accompanying label with a technical description (that will be 101 in all), it will quite be easy to package up for a ‘touring exhibition - not only around New Zealand but America, the UK, in fact worldwide - the sky’s the limit! Let me get back down to earth for a minute …… but it is good to have a plan, an ambition in mind, so that something productive and useful can result from the practical exercise of learning new techniques. 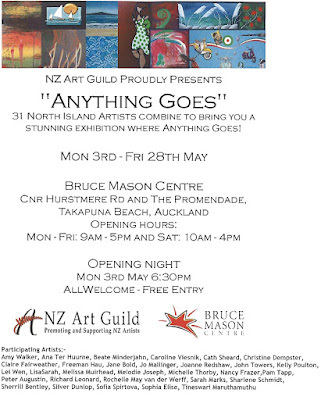 Invite to opening night of "Anything Goes"
I am proud to have two of my pieces featured amongst the images at the top of this invitation - my 'Seascape with Yachts' Art-Brooch and painting of 'Rangitoto Island'. I will be showing a total of thirteen small pieces of work, four paintings and nine Art-Brooches. 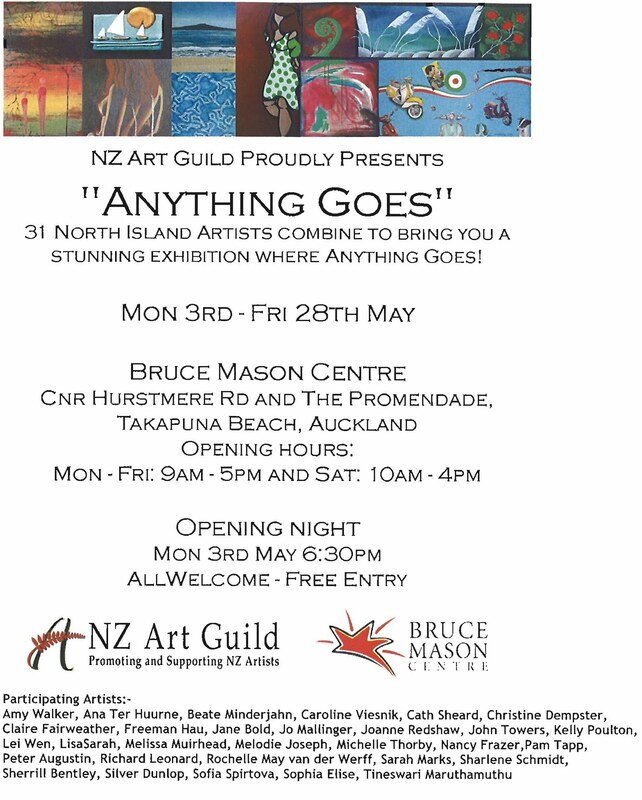 This will be the first time I have exhibited work with the New Zealand Art Guild and I am greatly looking forward to the event. I am so excited that this book has arrived. I have had a quick flick through it and it is packed with ideas – I cannot wait to start trying them out. This book was ordered through The Book Depository, a UK on-line book store, which I discovered recently. I am most impressed with the speed of delivery, this book came in less than two weeks, compared to the normal four weeks delivery time for books to New Zealand – and the best thing is that they deliver world-wide to most countries, free of charge. This company will definitely be my first choice for ordering books from now on. 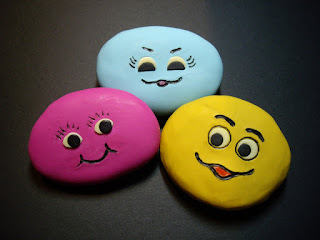 Just for fun, some covered pebbles with the 'glow in the dark' eyes, I made last week. I also tried photographing them in the dark but unfortunately, with my camera (even on the night setting), the glowing eyes did not show up in the actual photograph. This is my new acquistion (Farmers had an Easter sale on) - a mini oven, which will be dedicated solely for baking polymer clay. I have been conducting temperature trials today (to make sure the temperature remains relatively constant, with no temperature spikes), with clock and clipboard. The test strip I did baked OK, I just need to pluck up courage to bake a proper piece in it. All I have done today, is to bake a load of 'googly eyes'. I wanted to try out the 'glow in the dark' polymer clay before making anything serious with it. It did not use much of the clay to make the eyes, and I thought I could use them on some of my covered pebbles, just for fun. 1. Colour streaked polymer clay with metal leaf and silver gel pen additions, coated with satin glaze. 2. Mosaic-style tiles, coated with artist's matt acrylic varnish (it looks just the same as the satin glaze - it is not actually matt). This one is still in progress - I need to get some black grout to fill in the small spaces between the tiles. 3. Mokume Gane slices, with metal leaf, rolled into a black base clay. I do not want to glaze/varnish this frame, as I like the matt surface. The metal leaf seems well rolled in, so I think it will be durable.